Transform dull, flat and lacklustre locks with the Alterna Caviar Multiplying Volume Styling Mist; a volumising and thickening styling mist that lifts from the roots to create a fuller, plumper mane. 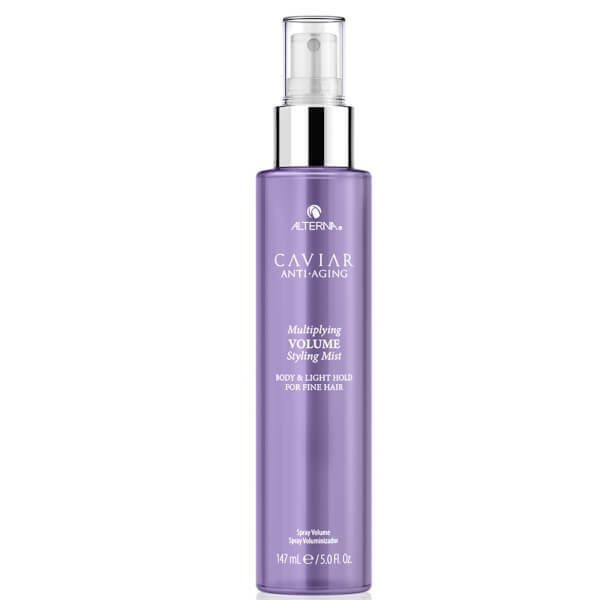 Part of the brand’s first collection of Caviar-enriched, anti-ageing haircare products addresses the intrinsic, chemical and environmental causes of ageing by restoring hydration, strength, vibrancy and elasticity. A fortifying Marine Plumping Complex that combines Omega 3 fatty acids with Seasilk® (an innovative blend of marine botanicals) minimises breakage and promotes healthy-looking locks from root to tip, whilst Colour Hold® technology maintains colour vibrancy for radiant and replenished locks with enhanced body. Spray throughout clean, towel-dried hair prior to blow drying. Water/Aqua/Eau, Polyimide-1, Panthenol, Caviar Extract, Algae Extract, Helianthus Annuus (Sun‑ower) Seed Oil, Macrocystis Pyrifera (Kelp) Extract, Laminaria Digitata Extract, Keratin, Hydrolyzed Keratin, Biotin, Phospholipids, Saccharomyces/Magnesium Ferment, Saccharomyces/Copper Ferment, Saccharomyces/Silicon Ferment, Saccharomyces/Zinc Ferment, Saccharomyces/Iron Ferment, Polysilicone-15, Palmitamidopropyltrimonium Chloride, Superoxide Dismutase, Ascorbic Acid, Glycerin, PEG-40 Hydrogenated Castor Oil, Disodium EDTA, Citric Acid, Propylene Glycol, Butylene Glycol, Potassium Sorbate, Sodium Benzoate, Phenoxyethanol, Ethylhexylglycerin, Fragrance (Parfum).